Review: Snake Oil and Harmony, Borderline London – Rockposer Dot Com! 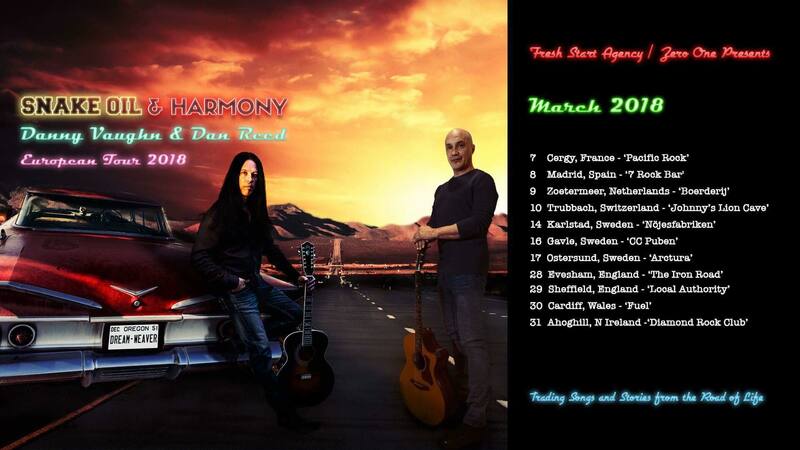 The Snake Oil and Harmony Tour is now on it’s third outing, with messers Danny Vaughn (Tyketto) and Dan Reed (Dan Reed Network) presenting an intimate, stripped back experience stretched over two hours. After experiencing Snake Oil and Harmony for the first time, my immediate reaction was why only two hours! I was so drawn into not only the music itself, played on acoustic guitars, which covered songs from across DV & DR’s wide and varied careers, but also the stories, some of them quite personal, and the general banter between the two performers and the audience. It was pretty obvious the audience were made up of Tyketto and Dan Reed Network etc fans, who sang along with much gusto to the delight of DV & DR. All of which just added to the overall experience. One things for certain, I’ll be buying tickets again at the earliest opportunity. Next Post: Crystal Ball Release New Single S.O.S.